Inverness will host a 7am remembrance service on July 1. One of the bloodiest conflicts in human history will be remembered in Inverness next month, exactly a century after the battle started. The four-month Battle of the Somme in northern France claimed almost 60,000 Commonwealth and French casualties on its first day. The poignant but informal 7am service remembering the catastrophe that began on July 1, 1916, will be held at the Cavell Gardens war memorial. Several Highland descendants of servicemen who perished during the campaign are expected to attend. The remembrance service will feature three blasts of a whistle which was the signal given on the day to go “over the top,” when the men clambered out of their trenches and took their lives in their hands, advancing towards the enemy. 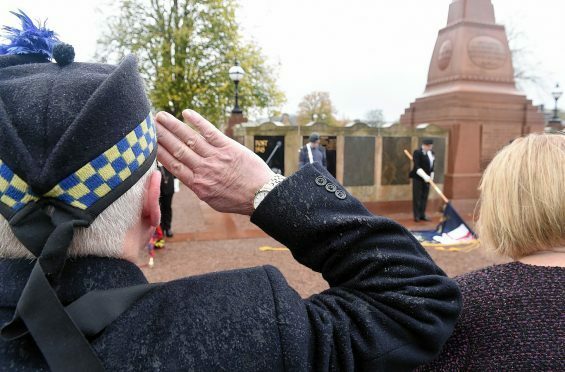 The anniversary event is being organised by the Royal British Legion Scotland. Its chairman Paul Wilson said: “We hope this will prove a significant event to bring things home to a wider public audience. Highlanders among the thousands who perished on the first day of the battle included Invernessians, Lieutenant Simon MacDonald of the 23rd Service Batallion, Northumberland Fusiliers (4th Tyneside Scottish) and Sergeant Kenneth Cameron, 2nd Batallion, Seaforth Highlanders, and Nairn-born Private Hugh Melven of the 15th Batallion Royal Scots, 101st Brigade, 34th Division. The Battle of the Somme, also known as “the Somme Offensive,” was a WWI battle fought by the armies of the British and French empires against the German Empire. By the end of the campaign, on the banks of the Somme river, more than 1.5million had died – 485,000 of them British and French. The battle was notable for the importance of air power and the first use of the tank. At the end of the battle, British and French forces had penetrated six miles (9.7 km) into German-occupied territory. That was further than in any other offensive over the previous two years.